With Chitranjan Dar at the helm, ITC Foods has become a Rs 5,000-crore company in a decade, despite being a late entrant into the $25-billion Indian food industry. Chitranjan Dar has every reason to smile. ITC Foods, the company he leads as Divisional Chief Executive, has revenues of Rs 5,000 crore - despite being a late entrant into the $25-billion Indian food industry. Last year, ITC Foods overtook the food business of India's largest consumer goods company, Hindustan Unilever, in terms of revenue. It leads in the Rs 4,500-crore branded atta category - its Aashirvaad brand has a 26 per cent market share. It is the third largest player in the Rs 21,000-crore biscuit industry, giving stalwarts such as Parle Products and Britannia Industries stiff competition. It leads in the cream biscuits category with a 26 per cent market share. Seated in his office on the sprawling premises of ITC's old tobacco factory in Bangalore, Dar can barely contain his excitement about his company's newest product, Farmlite biscuits, a premium oats-and-almond cookie. "One of our early learnings was that in India, taste is paramount in anything that one does," he says, biting into a Farmlite biscuit. "Nobody is going to sacrifice taste for the reason of health. It took us a while to develop something which will give us this combination." The biscuit, he says, is the first of a range of Farmlite healthy snacks. Dar, who never misses an opportunity to indulge in Kashmiri cuisine at the Royal Afghan restaurant at Windsor Manor (an ITC Welcomgroup hotel) in Bangalore, jokes that the ITC board probably got him to head their food business because of his size. As CEO of the food business, his favourite pastime is to shoot the breeze with Welcomgroup chefs, about recipes that could be converted into a sub-brand under the biscuit brand Sunfeast. The company has been able to innovate in a cluttered market, and come up with differentiated products in the mass and premium segments. Its deep pockets and willingness to pump money into the foods business helped, but Dar says it hasn't quite been a cakewalk. The company's first biscuit, called iBisc, bombed. Dar says iBisc was ahead of its time. "We realised that though we wanted to be different, it was also important to be strong in conventional categories," he says. That is why the company invested in conventional categories, such as glucose and cream biscuits, and chips. But breaching the strongholds of Parle and PepsiCo is not easy. ITC's distribution strength, built over decades, came to its rescue. Its distribution channels, which directly reach more than two million outlets nationwide and more than 4.5 million stores through wholesalers, would be the envy of any consumer goods company, says Raghu Vishwanath, Managing Director of Vertebrand Management Consulting. "ITC cleverly realised it has a starting-point advantage in distribution, and knew exactly how to reach big and small outlets across the country," he adds. Although there was some scepticism about stocking ITC's food products in the early years, the trust and credibility the company created through its distribution practice helped it break the ice. Sanjiv Puri, ITC's Divisional Chief Executive for trade, marketing and distribution of fast-moving consumer goods (FMCGs), says: "It has helped us drive penetration of FMCG products across channels, outlets and markets." While the launch and distribution of mass products gave the company much-needed scale, it wasn't a game changer, given that rival brands such as Parle and Britannia had a combined share of 70 per cent of the biscuits market. In noodles, ITC was pitted against Maggi, which had more than 75 per cent of the market. The only way for the company to make a dent was to innovate. "Getting into conventional categories was always part of the plan, but we were up against traditional hot rivals," says Dar. "We realised that... we need to understand the consumer and make the experience better. But consumer preference may not be the only driver. Therefore the need for innovation - for having something differentiated in terms of packaging, communication or product - would be very important for Sunfeast to become a strong brand." The gap that the company could take advantage of was at the premium end. It would also improve profitability, as margins were considerably higher than for basic biscuits and atta. What followed was months of effort, with Welcomgroup chefs trying to perfect recipes that could become successful brands. Dar says the chefs created as many as 40 or 50 options, and some became successful premium brands such as Dark Fantasy, Chocofills, Choco Melts, Delicious and, most recently, Farmlite. Devendra Chawla, CEO of the Future Group's Food Bazaar, says ITC Foods succeeded in the market because it went above the value chain and developed a market for value-added categories above the basic level. The strategy was timed well, as India was moving up the consumption curve, and even consumers in small towns wanted premium products. For example, Dark Fantasy, priced at Rs 30 for a 75g pack sells in 450,000 outlets nationwide, out of which 100,000 outlets are rural. Few customers are aware that the Aashirvaad atta in Delhi or Lucknow is not the same as in Bangalore or Chennai. Dar says that special blends and granulations for different markets has been key to ITC's success in a category where rivals have gone horribly wrong. He says: "We realised that the blend that people like in the North may not be the same in the South. In the South, which is not an atta-consuming market, atta has entered homes because it is considered a healthy option. In the North, atta is consumed daily, and the look and granulation required there are different." He says it took ITC three years of research before the atta finally hit the market. Future Foods' Chawla agrees that customising food for regional preferences is important. "Preferences change every 200 km," he says. "The dal in Maharashtra tastes different in Pune and in Kolhapur. Similarly, the paratha in North India is made of wheat flour, but the one in Kerala is made of maida." Brand specialist Harish Bijoor, CEO of Harish Bijoor Consults, says: "India needs and demands possibly 40 types of attas. ITC needs to invest in this through their R&D efforts. Catering to the commonality-run market will dry up as an opportunity, as consumers flock to brands that offer differentiations that they possibly don't even know they could crave." The company has the advantage of a strong link with agriculture. It sources more than 80 per cent of its wheat directly from 110 mandis. "There are 400 people sourcing wheat for us. This not only enables us to source the correct material at the right price, but it also leads on to development of materials," says Dar. Next up is regionalisation of spices. The company sells basic spices such as red chilli and turmeric powder in the South, under the Aashirvaad brand, and is planning spice blends for northern markets. "We want to master newer formulations of blended masalas to create differentiation," says Dar. "But we are not in a hurry." Here again, ITC's hotel business will play a role. "Our chefs are sitting on loads of interesting recipes," he says. 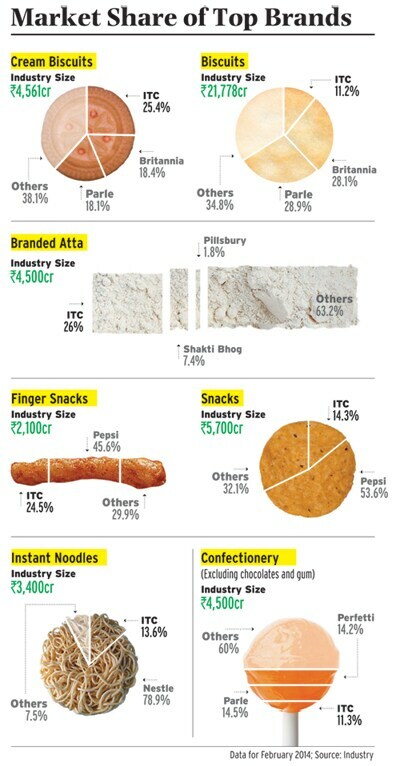 ITC has done well in the atta and biscuits markets - atta contributes 30 per cent to overall revenues, and biscuits, 40 per cent. But the snacks and noodles businesses are still in investment mode. The Rs 5,700 crore snack (potato chips and namkeen) market is dominated by PepsiCo and regional players. ITC's Bingo brand has a 14.3 per cent market share in potato chips, compared to more than 50 per cent for PepsiCo. Vertebrand's Vishwanath says ITC should have focused more on finger snacks, a Rs 2,100-crore market where it has a 24.5 per cent share with innovative products such as Mad Angles and Tangles. "They have wasted a lot of time taking on Lays, which has become a habit among Indian consumers. Nobody wants to accept a me-too," he says. Dar agrees that potato chips could do with more differentiation, which is in the works. "However, finger snacks is something we are extremely proud of," he says, reaching for a bowl of Tangles, his personal favourite. In noodles, where ITC's Yippee is pitted against Nestle's Maggi, Dar is happy that his company has a 16 per cent market share four years after launch, and confident it will grow. "We took three years to develop something to counter the competition," he says. They learned that many customers wanted a colour other than yellow, that most children add ketchup to noodles for the colour rather than taste, and that children find longer noodles more fun. "We came out with 30-40 recipes," he says, and adds that they were tested on consumers to pick the best one. The last decade has been good for ITC Foods. Sunil Alagh, brand specialist and former managing director of Britannia Industries, says: "ITC has to do new things to sustain growth, else they will take 10 to 20 years to overtake Britannia and Parle, which together have a market share of over 70 per cent in biscuits." 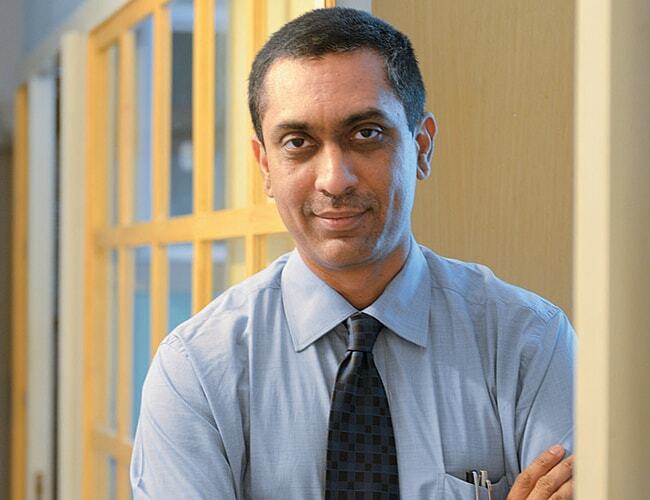 Vishwanath of Vertebrand says ITC should look beyond existing categories. "They have the resources to invest in category creation, and they should look at it, or they may lose their head start." Dar sees his company's innovations somewhat differently. "Isn't Mad Angles a category creator? Isn't Tangles a category creator?" he asks. ITC Foods's next big offering, he says, will be dairy. "Our initial products should be rolled out in less than a year from now," he says. He says he is keen to venture into frozen foods as well. "We also have interesting concepts around sauces and marinades, which will become large in India," he says. So far, ITC's Kitchens of India brand of ready-to-eat foods has fared better abroad than at home. 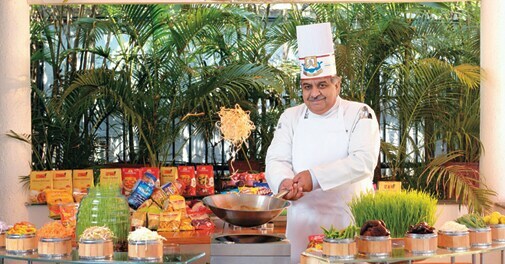 Dar hopes that, having overtaken HUL in the foods business, his company will become the country's largest food company. Bijoor cautions: "ITC needs to look at every vertical of the food and beverage segment in order to sustain its success." "ITC is never in a hurry"
Q. What made ITC enter the food business? Around 1998/99, ITC was looking at growing in terms of revenue. We looked at several businesses [including] foods. First, foods are a large business in India. Second, ITC had distribution might, built over 90 years. Our retail formats are kirana-driven. We wanted a business that could fit the vehicle. Third, ITC is known for incubating brands. Welcomgroup and Bhadrachalam were already shining examples. Fourth, ITC has competence in research and innovation. If we leveraged learnings from other businesses, foods could accomplish a lot. Fifth, and most important, ITC has always had strong agricultural links. The foods business can source the correct material at the right price. Q. Your maiden launch in biscuits didn't work. Can you comment this category? A. IBisc was in the market for about a year. We [also] got into the conventional glucose, creams, etc. We realised that we need to make it better to get consumer preference. But consumer preference may not be the only driver. So innovation - for having something differentiated either in terms of packaging, communication, product - would be important for Sunfeast to become a strong brand... I wouldn't say glucose didn't do well, but it was dominated by one large player [Parle G]. However, there was scope to differentiate in creams and cookies. We are No. 1 in creams today. We realised it is important to build Sunfeast as a brand. The launch of Sunfeast Dark Fantasy was successful. Then we got into pioneering products such as Chocofills [and] variants such as Coffeefills in the south and Chocomelts. Q. How much have you invested in the food business since inception? A. Around Rs 1,500-1,600 crore on buildings, plants, machinery, etc. In the next four to five years, ITC will, very conservatively, invest close to Rs 5,000-6,000 crore on foods. Q. Where do you see yourself as a company, international companies waiting to enter the market? A. We are not ambitious about capturing the world. In terms of understanding local consumers, we will always be good. We connect with India with our feet on the ground. I welcome the entry of international brands, because they create excitement and get the market growing. In this industry, the local guy has the advantage.